M. Romanelli, Johanna Grawunder. Inventario, no. 09. 2015 pp.60-80. S. Fuls, Die Modernistin Und Ihr Barbie-Prinzip. AD Germany, Nov. 2013 pp 100-103. A Boisi, Totem of Light and Mirrors. Interni, May 2013 pp 18-21. A.Dominguez Siemens, Johanna Grawunder Architect of Light. L’ArcoBaleno.com (Interview) 2013. J. Furio, The New City Lights. San Francisco Magazine, Feb. 2013. AD Collector, Design 2012, Les Minimaux Maximalistes/Johanna Grawunder. 2012. Pp 126-127. M.Valenti, Riflessi di Luce. Casamica, No.6, 2012. Pp98-106. L. Bossi, Le Mille Luci di New York, DOMUS, April 2010, pp. 10-11. G. Cerio, Radiant Cool, MODERN, Fall 2010, pp.106-113. G. Cerio, Complementary, MODERN, Summer 2010, pp. 30-36. N. Vinson, Best-Lit Lunch, Design Awards 2010/WALLPAPER, February 2010, p. 76. S. Casciani, A Time for Every Design A Design for Every Time, DOMUS, May 2009, Milan. 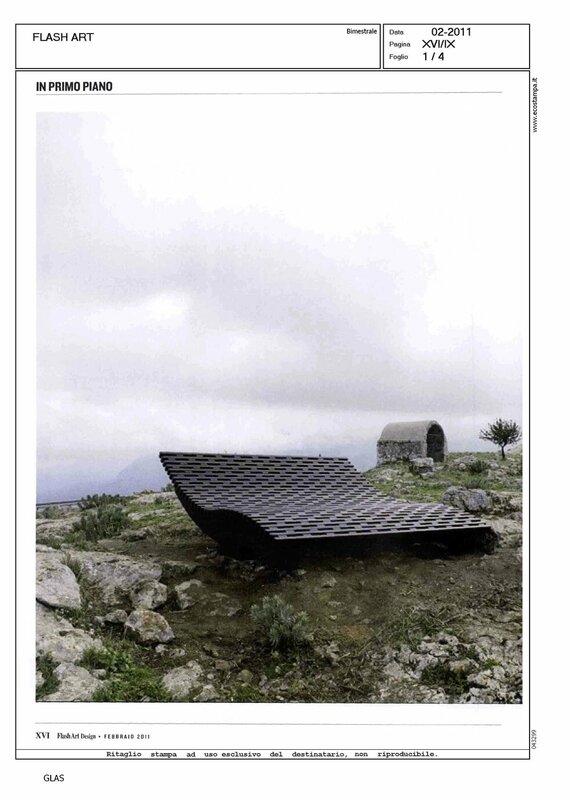 P. Monteiro, Scintillating Design, VOLT, July, August, September 2009, pp80-82. Limited Edition Cover, WALLPAPER, April 2008. M. Grozik, Beach House in Milan, DWELL, February 2008, pp.134-135. E. Louie, Making Rooms Glow, New York Times, Jan. 27, 2008. C. Fabiani, Arte/Design, ELLE DECOR, Jan-Feb 2007. S. Casciani, Johanna in Wonderland, DOMUS – The Sensitive Kitchen, April 2006. Milan. G.Cerio, High Limits, HOUSE AND GARDEN, June 2006. New York. A. Sansom, Light Fantastic, WONDERLAND, Issue 3, March 2006, London, UK. 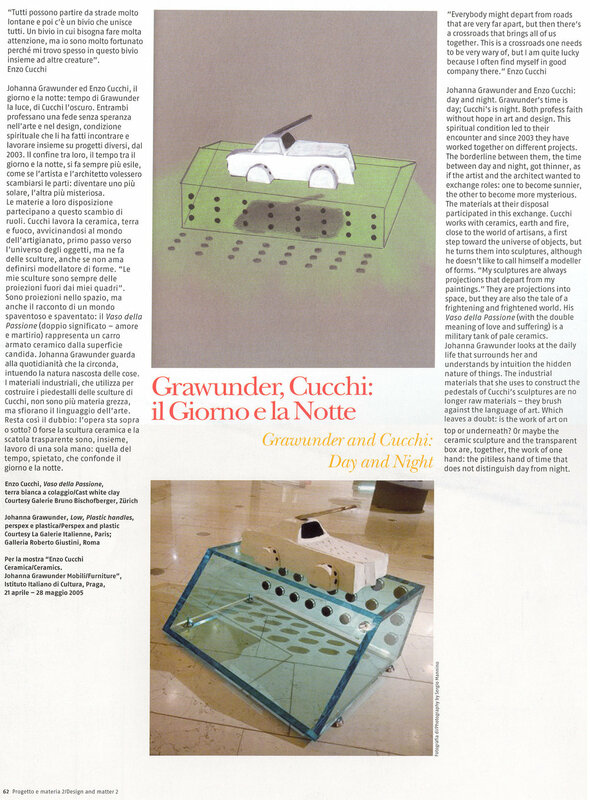 L. Bossi, Grawunder, Cucchi: Day and Night, DOMUS, Novembre, 2005.Milan. Home is Where the Art Is, New York Times Magazine, 27 November, 2005. P. Monbrison, Nihilisme Pop, AD FRANCE no. 45, Nov. 2004, Paris. A. Hill, Off the Wall, WALLPAPER, March 2004. London. 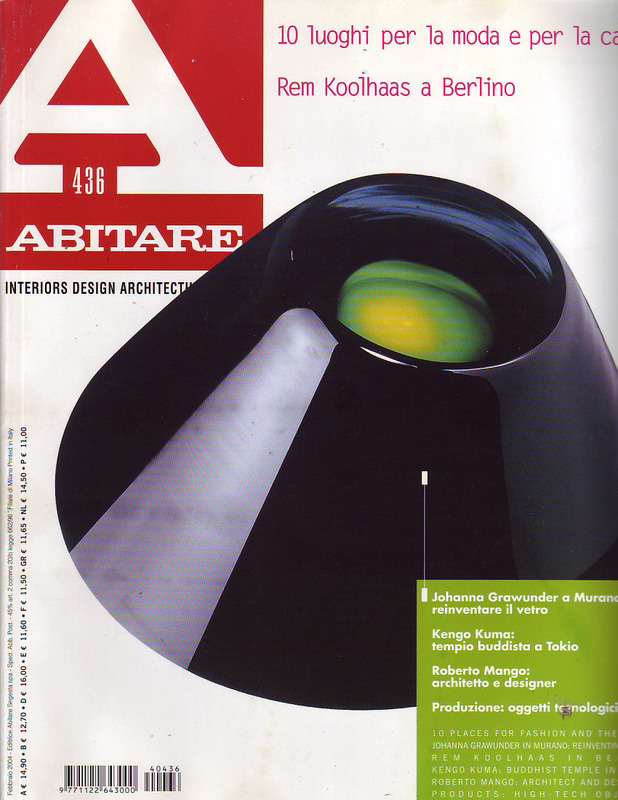 Interior 2003, ABITARE no. 432, October, 2003, Milan. Z. Sardar, The Lights Fantastic, San Francisco Chronicle Magazine, April, 6, 2003, San Francisco. E. Sottsass, Inside Contemporaneity. Masks (catalogue). Rome; Galleria Roberto Giustini Rome, 2002. L. Bossi, Rough Luxury , DOMUS no.848, May 2002, Milan. K. Klages, World’s Apart, Chicago Tribune, May 3, 2001, Chicago. C. Klien, Die Lichtgestalt, H.O.M.E. no. 04/01, April, 2001, Berlin. M. Cadji, Johanna Grawunder, BEAUXARTS no.8147, May 2001, Paris. 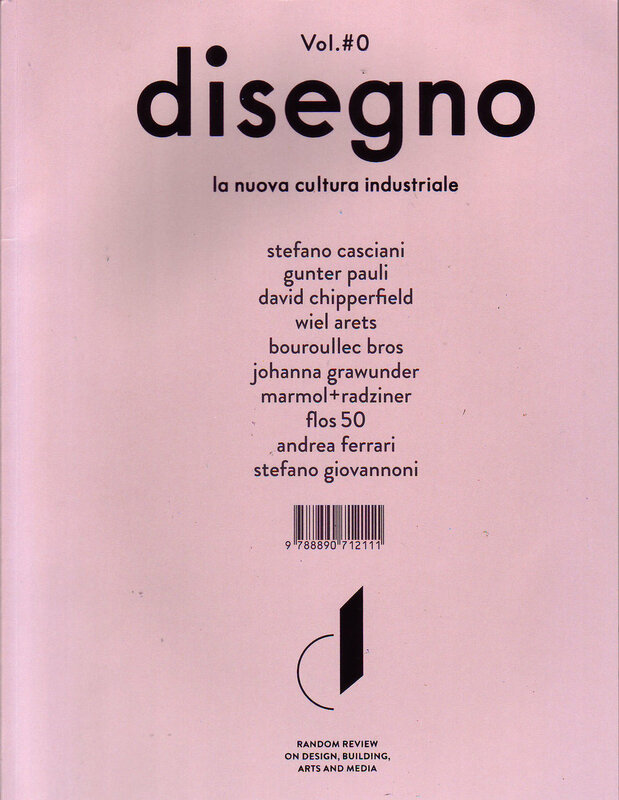 S. Casciani, Industrial Nostalgia, ABITARE no.398, Sept. 2000, Milan. B. Radice, Johanna Grawunder and modernity. Fractals (catalogue). Milan: Galleria Post Design, 1999. E. Sottsass, Johanna Grawunder. Lighting Management (catalogue). Milan: Galleria Post Design, 1997. C. Roux, Artificial Altars. BLUEPRINT no. 118, June, 1995, London. L. Prandi, Tra Sentimento e Technologia, MODO no. 170, March, 1996, Milan. A. Henschel, Handle With Care. Frankfurt:Trademark Publishing und Autoren. 2015. pp140-141. A. Griffiths. 21st Century Lighting Design.London: Bloomsbury. 2014.p188-189. M. Vignal, Femmes Designers.Geneva: Aubanel. 2009. pp.198,199,200. S. Lovell. Limited Edition. Basel: Birkhauser Verlag AG. 2009 pp. 121, 122, 194, 195,2 42,243. S. Yelavich, Contemporary World Interiors. New York: Phaidon, 2007. pp.118-119. M.L. Jousset, Johanna Grawunder Foreign Policy. Paris: La Galerie Italienne, 2007. Cocinas Diafanas. Barcelona: Loft Publications, 2007. Lacagnina, Ma non al sud. Milano: Silvana Editoriale, 2005. C. Broto, New Domestic Interiors. Barcelona: Structure, 2005. Y. Futagawa, GA HOUSESProject 2005 no. 86. Tokyo:A.D.A EDITA Tokyo Co. Ltd., 3/2005. A. Guerriero, Dressing Ourselves. Milan: Edizioni Charta, 2005. J.M. Stahl, Dish. New York: Princeton Architectural Press. 2005. W. Xu, EU Make. Bejing: China-Building, 2004. S. San Pietro, Urban Interiors 4. Milan: Edizioni Archivolto, 2004 pp. 110-117. World Atlas of Contemporary Architecture. London: Phaidon Press, 2004. S. San Pietro, et al. New Offices in Italy. Milan: Archivolto, 2003. E. Terragni, Spoon. London: Phaidon Press Limited, 2002. W. Xu, Johanna Grawunder. Bejing: China Youth Press, 2001. M. Rendel, R. Spitz. Daring the Gap. Cologne: Edition Axel Menges, 2001. Y. Futagawa, GA HOUSES 68. Tokyo:A.D.A EDITA Tokyo Co. Ltd., 11/2001. M. Carboni, Sottsass Associati/Frammenti.New York: Universe Publishing, 1999. J. Grawunder, Barcode. Ravenna: Futurarium School of Architecture and Design, 1995.